Just take a drive down the Southern California coast, and visit some of the best beaches in Los Angeles, Orange County and San Diego. Get your Vitamin D and don’t forget to apply plenty of sunscreen or sun tan lotion. There’s nothing like the cold ocean water to dip your feet in on a hot summer day. If you live near the coast you can enjoy some of the best sunrises and sunsets. Even if your not a beach person you can enjoy a jog or even a walk along the boardwalk. If your having a rough day just take a drive to your nearest beach and clear your mind and take in the ocean breeze. Enjoy reading? Take your favorite book or the one you never finished reading on your next beach trip. Here are just a few Southern California beaches to look into; Laguna Beach, Coronado, El Matador Beach, Venice Beach, Newport Beach, Hermosa Beach, La Jolla Cove, Catalina Island, Crystal Cove State Park, Santa Monica. Why not enjoy a great view during dinner? There’s nothing like a great sunset or city lights while your wining and dining. The best way to unwind from a stressful day is to be taken to a place you’ve never been. Why not experience what your local city has to offer when it come to dinning rooftop style. If your not looking to dine on a rooftop why not have a couple of cocktails? The nightlife is even better. Check out what your city has to offer in rooftop dinning. Ice cream is the perfect frozen dessert for a hot summer day. People of all ages young and old can enjoy a cup or a cone of ice cream. Now that summer is coming to an end enjoy as much ice cream as you can. There are so many types of ice cream it is hard to only choose one. What’s your favorite flavor? Here are just a few to consider on your next ice cream trip; cheesecake, raspberry ripple, mint chocolate chip, double chocolate, chocolate fudge brownie, honeycomb, cookie dough, pralines and cream don’t forget check out your local ice cream polar to see what they have to choose from. Check out your best seller list and look into what interest you. Here are just a few great books on the USA TODAY’s Best-Selling Books list ranks the 150 top-selling titles each week based on an analysis of sales from U.S. booksellers. 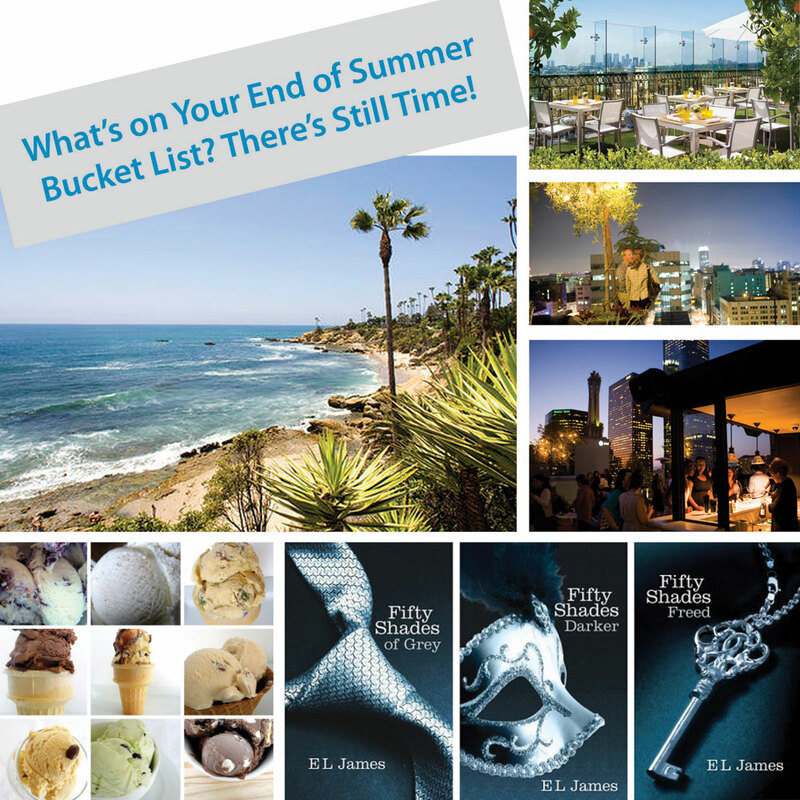 Fifty Shades of Grey, Fifty Shades Darker, Fifty Shades Freed are on top-selling list by E L James. You could practically take a good book anywhere. Why not close your summer with one last read. Check out your local monuments in your area. Check out the historical location in your city or town. Visit your local museum or art gallery. If your not into art check out fun and exciting events going on in your town such as music festivals. Do some research and ask around. What does your city or town have to offer? Check out tourist attractions like amusement parks or local fairs. How are you going to spend your last days of summer?